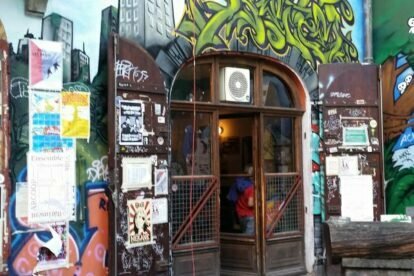 Just 2 minutes from the railway station this alternative café, bar and concert hall has some good vibes. A good place to meet people and have a nice evening. The concerts and party program always offers good surprises and discoveries. It is a good opportunity to get to know local bands and collectives, like the Cave 12. A bit underground, L’Ecurie warns that there are no reservations and, that “when it’s full, it overflows”. But don’t worry there is a courtyard if you need fresh air. The location of the place is interesting for its spirit. L’Ecurie spreads and is spread around “L’Ilot 13” (trad. The Block 13). This 30-year old project describes itself as a laboratory of living together, self-management and social participation. It regroups in one block habitations, workshops and associations. The architecture of the block reflects these values through a nice mix of new and old buildings covered by plants, graffitis and colours.